• There were 22,721 home sales during the second quarter of 2016, up by 4.4% from the same period in 2015. We finally saw a much-needed increase in listings, which rose by 30.1% between first and second quarter. This increase in the number of homes for sale led to an increase in sales, which rose by 4.4% when compared to the same period in 2015. • Island County saw sales grow at the fastest rate over the past 12 months, with sales up by 22.1%. This is a small county which is subject to wild swings, so I take the data at face value. That said, the larger Thurston County saw sales up by an equally impressive 19.7%. Most interesting is that King County saw sales fall modestly compared to the same time period in 2015. Price—and supply—are clearly an issue in the most populous county in our state. • Overall listing activity was down by 21.8% compared to the second quarter of 2015, but the good news is that the supply side deficit is actually getting a little less than we have seen over the past few years. 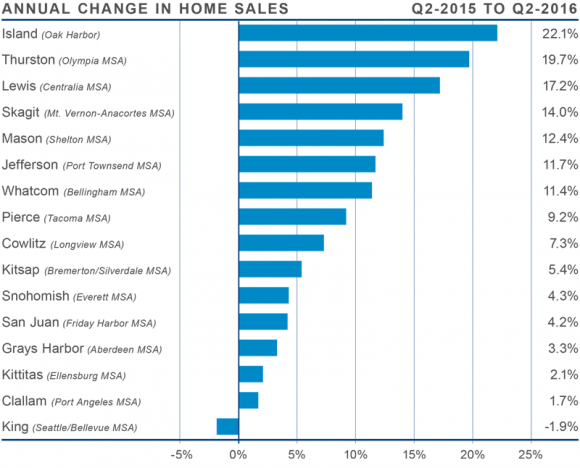 The total number of homes for sale was 30.1% higher than seen at the end of the first quarter. While much of this can be attributed to seasonality, it is still nice to see! 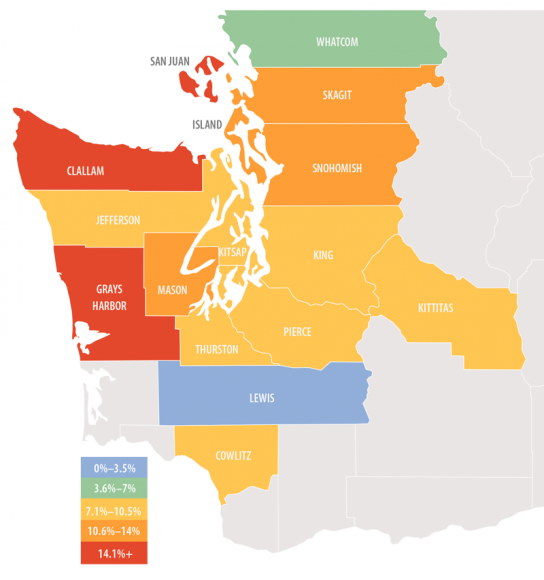 • The region is experiencing positive job growth, and with it, migration to Washington State is running at a very brisk pace. Given these factors—in addition to our lack of new home construction—it is not surprising to see demand substantially usurping supply. As I look forward, I believe inventory levels will continue to rise modestly, but it will remain a solidly seller’s market for the rest of the year. • With demand still exceeding supply, we should not be surprised to see average sale prices continuing to rise, as is certainly the case in our region. 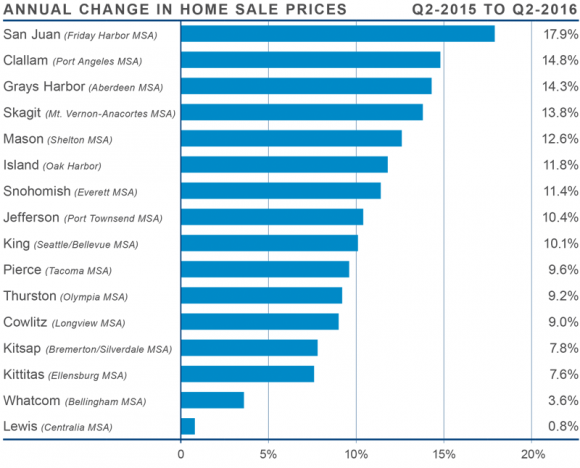 Home prices rose by 8.1% between the second quarter of 2015 and the second quarter of this year. This is down from the annual rate of 10.1% that we showed in our last report, but the rate is still far higher than the historic average of 4%. 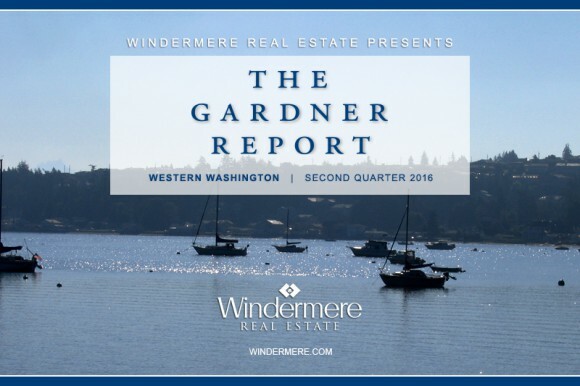 • Regular readers of this report will remember that there were several counties where average sale prices in the first quarter were actually lower than seen a year before. I suggested that seasonality was to blame and that was indeed the case, with all counties in this report now showing annualized price gains. • When compared to the second quarter of 2015, price growth was most pronounced in San Juan County and, in total, there were nine counties where annual price growth exceeded 10%. • The prevailing supply/demand imbalance continues to push prices higher, and persistently low interest rates are just adding fuel to the flames. If rates stay at current levels, it is unlikely that we will see much in the way of slowing appreciation for the rest of the year. • The average number of days it took to sell a home dropped by 17 days when compared to the second quarter of 2015. • It took an average of 67 days to sell a home in the second quarter of this year—down from both the 86 days it took to sell a home in the first quarter of this year, and from the 84 days that it took to sell a home in the second quarter of 2015. • The only market where the length of time it took to sell a home rose was in the notoriously fickle San Juan County, where it rose by 30 days to 196 days. 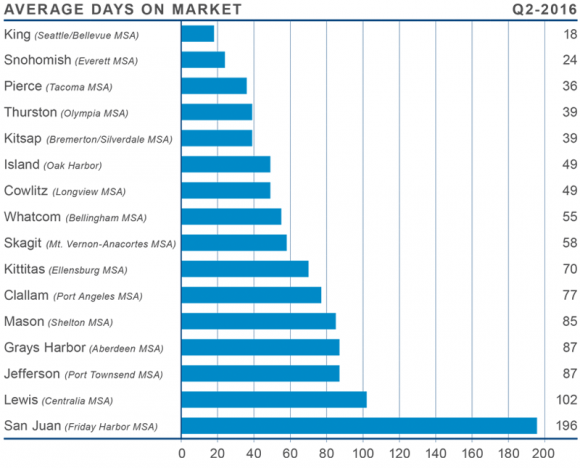 In the rest of the region, the average decrease in the time it took to sell a home between the second quarter of 2015 and the second quarter of 2016 was 20 days. • Snohomish County has joined King County as a market that takes less than a month to sell a home. At 18 days, King County is unarguably the hottest market in the region, but sales are slowing due to the lack of inventory. This imbalance is unsustainable over the long term.